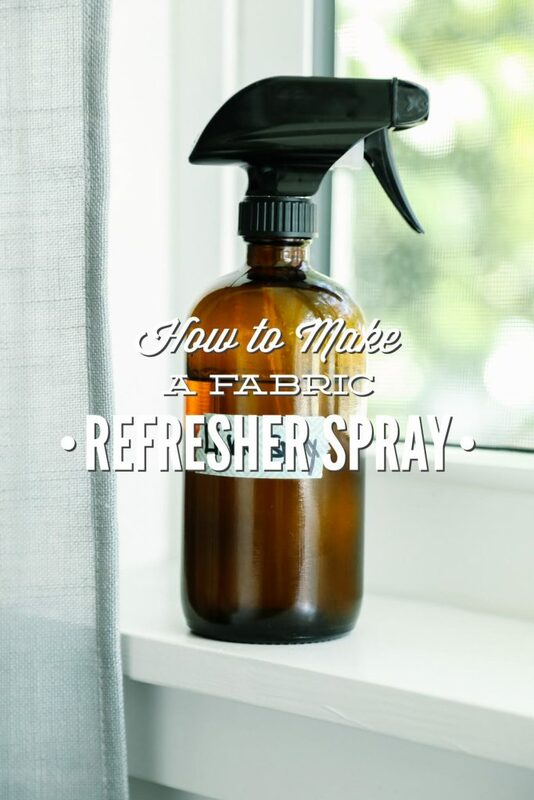 Over the past several months, I’ve received a ton of requests from readers for a fabric (AKA: linen) refresher spray. A spray that is made with simple and real ingredients, and may be used in place of the artificially-fragranced spray sold in most conventional stores. The ironic thing about these requests is that I’ve been making and using a fabric refresher, when needed, for a couple of years now, but I haven’t actually talked about the recipe on Live Simply. With the holidays just a few weeks away, a time when many of us will be cleaning and freshening our homes for company, I can’t think of a better time to publicly share a simple fabric refresher recipe. Inviting company into my home means that people will sit on the same couch as stinky Toby (our dog), use the same bathroom as my kids, and sit on the heavily-soiled chair cushions in our dining room. Before company arrives, the bathrooms need to be given extra special cleaning attention, the cushions on the chairs need to be washed, and the couch needs to be refreshed so it doesn’t smell like a dog just sat on it (Toby…). It’s not that I’m afraid of being authentic. Dirty white cushions and a couch that smells like good ol’ Toby are definitely “authentic.” It’s just that I want our guests to be comfortable, and a clean house (well, as clean as possible) is definitely a step in the comfortable direction, in my opinion. 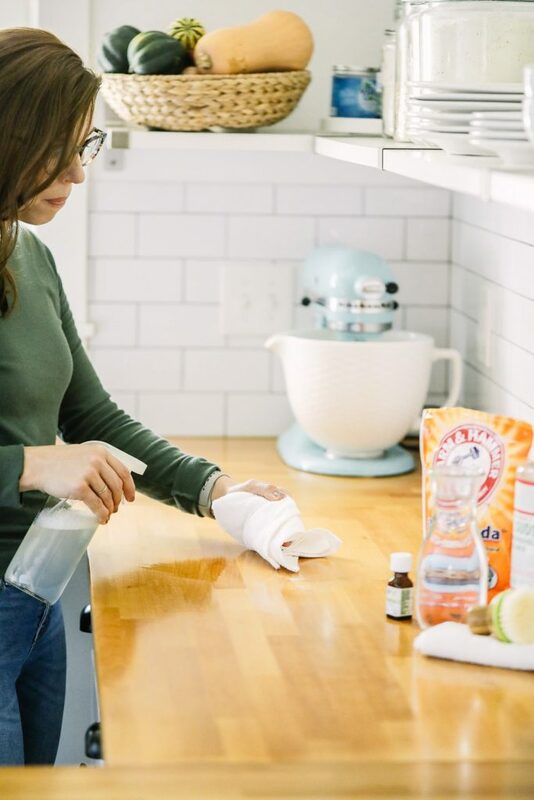 Thankfully, I have plenty of homemade cleaner recipes to help get my home as clean as possible, without the unwanted fumes or toxic ingredients. My simple all-purpose spray works wonders in the bathroom. My bleach alternative and homemade laundry soap are just the solutions needed to clean the white dining room chair cushions. And, finally, to take care of the Toby-scented couch, I turn to a homemade fabric refresher spray. 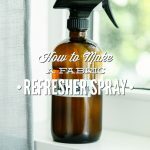 My homemade fabric refresher spray is just as simple to make, if not easier, than the other cleaning products that I mentioned. The spray only requires three basic ingredients: high-proof vodka, water, and essential oils. That’s it! You’ll probably recognize this combo as the same ingredients that I use to make a disinfectant spray and air freshener. Friend, this is literally the exact same spray, just with a special title: fabric refresher. This means that one spray may be used multiple ways. The holidays are probably the last thing most of us want to think about. After all, it’s only October. If you’re anything like me, just thinking about making dinner and getting the kids to bed requires all the mental capacity and energy available to one person. 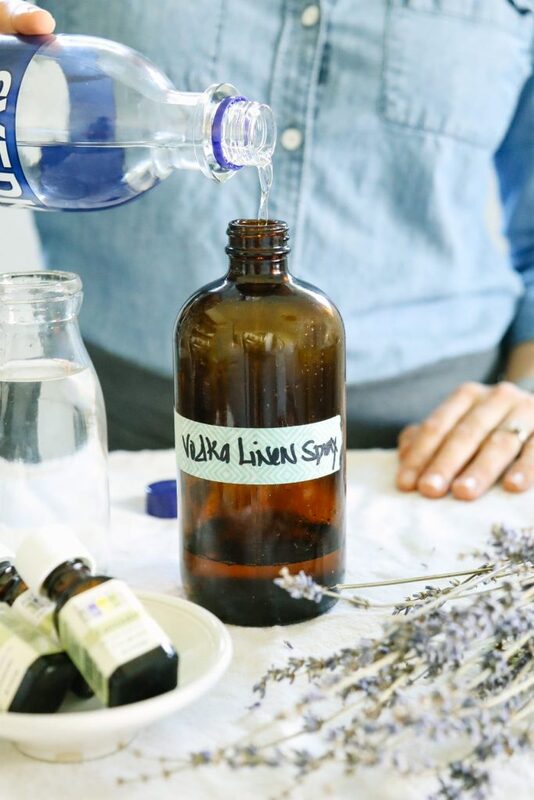 Whether you tuck this recipe away for the upcoming holiday season (and the gatherings you may have in your home), or use this spray right now as a daily fabric refresher, I think you’ll love the naturally-clean scent as much as I do. 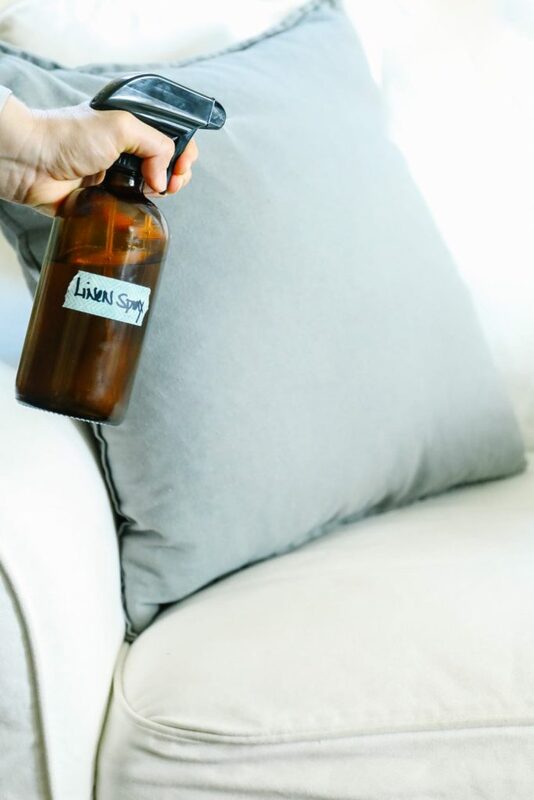 My homemade fabric refresher spray is just as simple to make, if not easier, than the other cleaning products that I mentioned. The spray only requires three basic ingredients: high-proof vodka, water, and essential oils. That's it! 1/2 cup water Distilled water if possible. 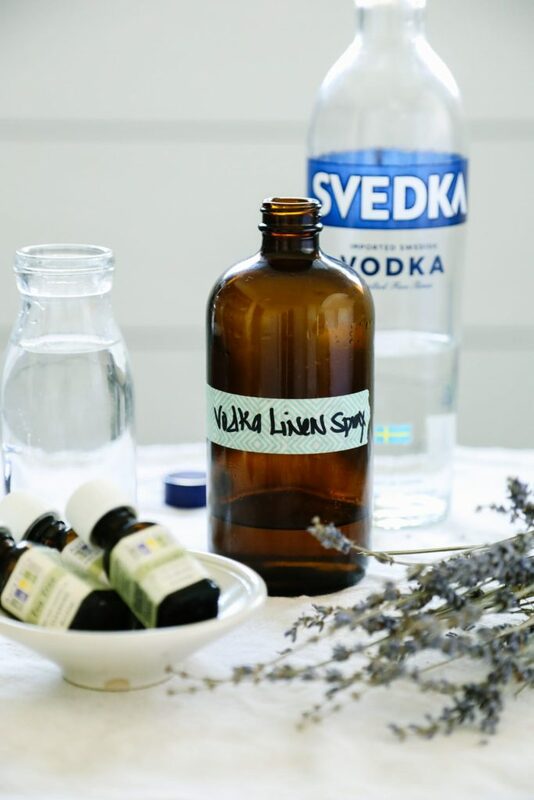 Pour the vodka into a spray bottle (pictured), and then the essential oil(s). Shake the bottle to combine the vodka and oils. Finally, add the water and shake the bottle again. The spray doesn't have the strong scent that's generally associated with artificially-fragranced sprays. To Use: This spray is multi-purpose, so it may be sprayed on most surfaces, including fabric and linens. Shake the bottle before each use. The essential oils listed in the recipe are my favorite, and may be substituted with your favorite essential oils. 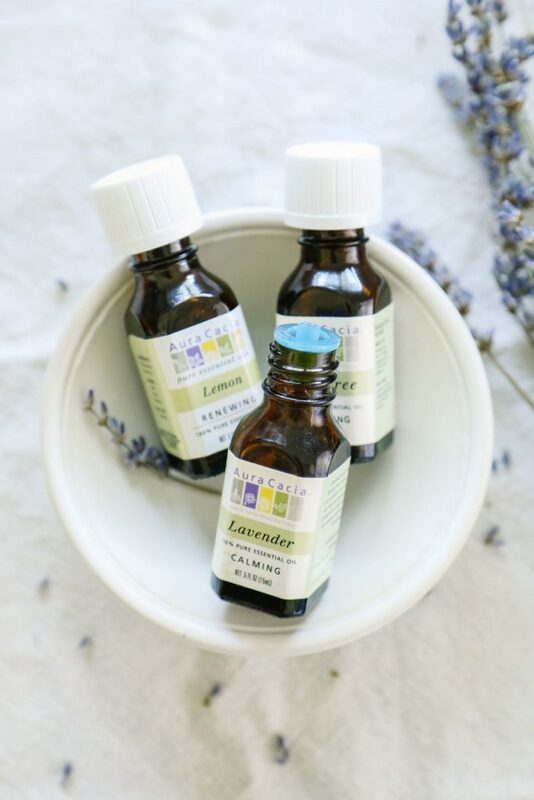 Lavender, lemon, and tea tree are incredibly versatile and safe to use around children. The tea tree oil may be left out if you’re not a fan of this scent. Another option is to use a blend. I personally love the blends (AKA: Synergies) from Plant Therapy. Essential oils may stain some fabrics, so always be careful when spraying this solution on delicate fabrics/linens. I personally haven’t had any issues with the fabrics in our home. The essential oil amounts may be reduced, or slightly increased, according to your preference. If you’d like to add a deodorizing ingredient to this spray, to help neutralize odors, add 1-2 teaspoons of baking soda to 1/2 cup of hot water (not boiling). Add the mixture to the vodka in the spray bottle. My only cautions with this method are: 1) Baking soda will leave behind white spots on colored fabric. 2) Baking soda may clog your spray nozzle. Not all spray nozzles are created equal, so this issue will depend on your spray bottle/nozzle. Witch hazel (with an alcohol base) or Everclear may be used in place of the vodka. That’s so great, Adrianne! Enjoy!! Hey Bree, Yay, I’m so glad you can use this spray. I’ve been noticing the fabric softener recipes as well…the ingredient choice kind of puzzles me. Thank you so much! We have three lovable, but definitely smelly dogs and we are selling our house, so I found this article just in time. I can’t wait to try it out. Hey Krista, I’m so glad to hear that! Enjoy!! Could this be used as a nighttime pillow spray with different essential oil choices? Or would the vodka be too drying? Maybe you have a different recipe for a nighttime pillow spray for relaxing? Hey Megan, This will work perfectly! Thank you! I’ve stopped using the commercial fresheners, and this was quick and easy to mix up! I used lemon/eucalyptus blend + lavender essential oils, and I love the fresh scent. Great idea! Yay, Julie! That sounds like a lovely combo! Hi, this won’t stain fabric?? Just concerned about the oils…:) Thanks!! Hey Amy, Essential oils usually don’t. You can always perform a small test spray first, too. EO’s aren’t like vegetable oils, which leave behind grease stains. We used this same spray in the theater without the essential oils to “clean” costumes until the end of a run when they could be dry-cleaned–we used it on uniforms, wool, and heavy non-washable fabrics. It was great at removing odors. I was looking to update the recipe and this is perfect! Thank you. Hey Key, I don’t believe so. The oils provide fragrance and beneficial properties. I have a quick question. I am new to the essential oil world and I have seen alot about not putting them in plastic bottles. Once this the oils are mixed with water and vodka are they safe to store in plastic? Or should I buy glass spray bottles? Hey Maria, For short-term use, plastic should be fine and it helps that this isn’t going on your skin. For long-term use (which this product isn’t designed for), glass is best. Lol, good question, April. Vodka is usually odorless, so I don’t believe so. You could add plenty of peppermint essential oil. Can this fabric refreshner be used for ironing clothes the way commercial sprays are used as a dampner for wrinkles before ironing? Hey Sharon, Yes, it can. Vodka works well for this use. Just skip the essential oils. I made this yesterday and am so excited start making natural cleaning products! My biggest problem is my husband hates the smell of lavender. Eek. I am trying things out while he is away from home, but if he had been here when I sprayed the first couch cushion he would have killed me. I was also going to make the reusable surface wipes but there is so much more lavender than the lemon and such. I love lemon. Do you have a recommendation for how to use less lavender in some of your recipes? Also, is lemon essential oil always yellow or did I buy a cheap kind. Hey Kate, You could definitely use a different essential oil for the recipes calling for lavender. I think grapefruit, sweet orange, and lemon are lovely. I also love peppermint and eucalyptus (just be careful around children). Lemon essential oil is usually pale yellow. This is normal :). Hi Kristin, can this be spritz onto clothes prior to ironing? Thanks! Hey Charmaine, You can! I would just skip the essential oil. Thank you for your great information, I will try to make it myself for my fabric covered furniture.